SAP Activate is the next generation SAP implementation framework that gives customers the freedom to get up and running quickly to innovate continuously with SAP S/4HANA Cloud. SAP Activate combines SAP Best Practices, guided configuration, and implementation methodology to get your organization onboarded onto SAP S/4HANA Cloud to run your business live. In this SAP Activate blog series, which Sven Denecken kicked off, you will learn about the six phases in the framework: Discover, Prepare, Explore, Realize, Deploy, and Run. If you missed last week’s blog about the Discover and Prepare phases, you can read it here. In today’s blog, I will focus on the implementation of SAP S/4HANA Cloud and the key milestones in the Explore phase. The Explore phase has significantly changed the way customer solutions are implemented, especially in the cloud. It focuses on validation of the solution functionality which is in the project scope and confirmation that the business requirements can be met with the standard business processes delivered in the product through the Fit-to-Standard analysis workshops. Project teams driving efficient and rapid implementations understand the tradeoff between including additional features into their project scope vs. using standardized pre-delivered configuration. The benefit of using SAP S/4HANA Cloud is that the pre-delivered scenarios and processes in the solution represent an excellent way to validate the fit of standard processes in a customer’s business while leaving space for including unique differentiators that should be implemented using the extensibility capabilities of the solution. In the Explore phase of SAP Activate, it is critical for project teams to understand the processes available in SAP Best Practices, which teams utilize to standardize and avoid additional unnecessary efforts. The Fit-to-Standard analysis is conducted in a series of workshops and allows for validation of predefined scenarios agreed upon and to make room for enhancements or additional configuration required (i.e. self-service configuration, expert configuration, forms, reports, business roles and other solution extensions). To prepare for this workshop, it is recommended that teams get familiar with the SAP Best Practices content, including the process flows, test scripts with sample data, and other documentation available in SAP Best Practices Explorer. 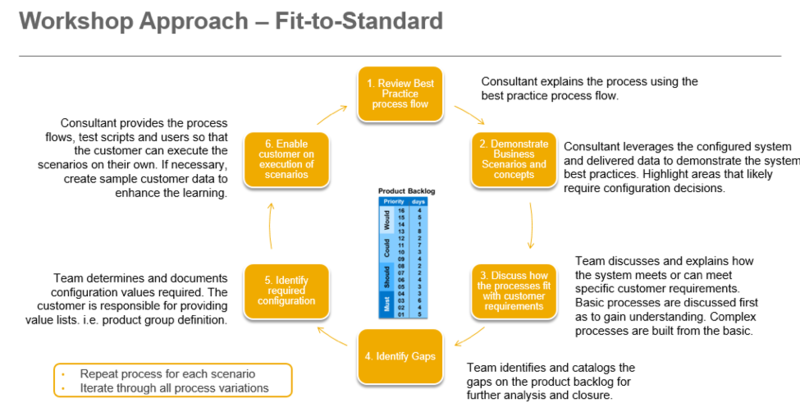 Consultants should also evaluate the necessary adjustments to the sample data provided in the customer Starter System prior to running the workshops – for example, adjusting the organization names and master data to make the data applicable to the organization and users that will attend the fit-to-standard workshops. During the workshop, consultants will do a “show and tell” for related business processes to show the customer business users how the processes run in the system (the team uses Starter system that was provisioned in Prepare phase). For example, a purchasing clerk at a global manufacturing customer implementing SAP S/4HANA Cloud is interested to see how the system will function, and how closely it will support their needs. The consultant runs through the end-to-end process of a purchase order from the initiation of the order from a user scenario to the finalization of the order and invoice from the customer side. The consultant toggles back and forth between the user roles to display the process of creating a purchase order to the completion of the task. These demos give the customer and project team an idea of how the system functions in various business scenarios. Consultants also ask questions that help them identify the needed configuration and potential functional gaps. Refer to the image below for overview of the steps the fit-to-standard workshops follow. Fit-to-Standard workshops must be held in an efficient manner with customer subject matter experts to reduce backtracking later in the implementation and to enable the customer on the execution of the scenarios. 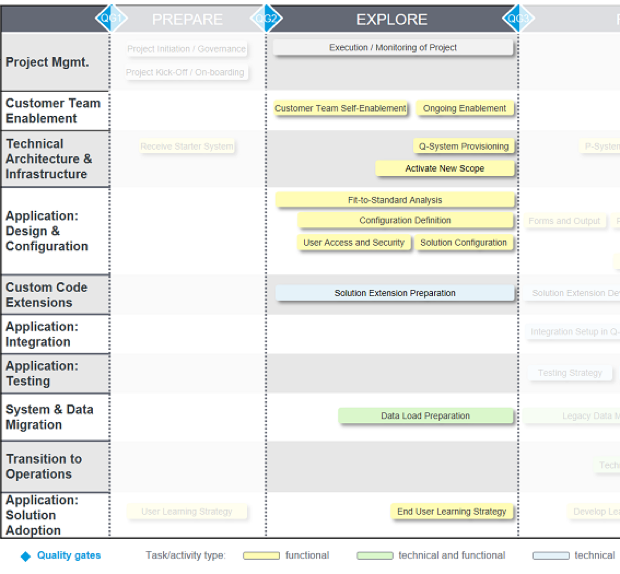 Project teams must be focused and have an open mind to understand how the preconfigured and predefined processes offered in SAP S/4HANA Cloud can simplify the customer’s existing processes and can do so through a process described in a structured Guide for the Fit-to-Standard presentation. Business processes which align to the solution are standardized to eliminate major process mapping and design. Thus, allowing for teams to focus on value-added activities. Key questions and discussions on the existing customer processes need to be raised and addressed to understand how to fit those processes into the new solution. Customers and project teams have the option to adopt pre-delivered SAP Best Practices processes, setup integrations, and use in-app extensibility. If those options are not feasible due to the nature of the gap, the application can be extended. All these items are captured by the project team in a backlog, and then prioritized. For items that are classified as gaps, the project team performs further analysis to understand if the functionality gap is (1) going to be covered in upcoming release, (2) there is an existing extension that can be used, or (3) there is a need to undertake the effort to extend the application and integrate. The SAP Activate methodology provides guidance for all these cases. Enter the Fit-to-Standard workshops with an open mind and involve subject matter experts in the discussions. Utilize the predefined configuration in the SAP S/4HANA Cloud solution to drive adoption of the standard, allowing your organization to innovate with every quarterly release of SAP S/4HANA Cloud. For solution enhancements or additional configuration which is required, prioritize items in terms of high importance to keep project timelines and expectations in on track. Think about multiple incremental releases to the business, rather than one big-bang deployment. We will now cover the rest of the Explore phase activities in a short outline. Next, project team confirms the integration of any non-SAP S/4HANA Cloud systems (i.e. SuccessFactors, Ariba, Fieldglass, etc.) can be executed. Prior to executing the possible integrations, settings within the non-SAP S/4HANA Cloud solutions need to be adjusted prior to integration setup. This process allows for a simplified and streamlined flow between the disparate systems so they can be integrated with one another for maximum value. Additionally, the project team requests provisioning of the Quality System and provides the SAP Service Center with necessary details for activation of customer-specific processes and values (like organization structure, Chart of Accounts, etc.) that the team identified and confirmed in the Fit-to-Standard workshops. The next activity includes testing preparation where the project team outlines the testing strategy including objectives, scope, the testing tool, defect coordination, and the required roles for testing. The project team also begins reviewing and mapping out the user access and security, key user extensions, and perform data load preparation activities for when the system is available. They also work on an end-user learning needs analysis and plan so the users can familiarize themselves with the new solution. The learning team will also be involved to prepare and deliver the learning content to the identified testers. Finally, the Explore phase can formally close when the project team conducts deliverable sign-off following the prescribed quality gate activities. The next phase in the SAP Activate methodology is the Realize phase which includes receiving the systems, performing configuration in the Q-System, P-System setup, data loads, and delivery of key-user training. Stay tuned for the next blog which will be released next week on Wednesday where we will cover the Realize phase of SAP Activate for SAP S/4HANA Cloud. To stay informed about new posts in this blog series, make sure to follow us via @SDenecken and @janmusil. The blog posts will appear in the SAP Communities space with tag #sapactivate, and will also be announced on the SAP Activate Methodology Jam group (request access here), the community of 20k people already actively engaged. If this topic series interests you, we want to pre-announce the soon to be released e-book SAP S/4HANA Cloud: Implementation with SAP Activate which will become available in a few weeks from SAP PRESS. Let us know your thoughts and feedback either in the comments to this blog series or in the SAP Activate Jam group(s). We want to thank Esther V., Florian M., and Martin R. for contributing to this blog. Hi Jan, thank you for the extremely helpful info! Is all of this customization available for public cloud in addition to Hana Enterprise Cloud? Thanks, Mark. Yes it is available for SAP S/4HANA Cloud content. Very well explained…simple and easy to understand with suitable examples. Thank you.